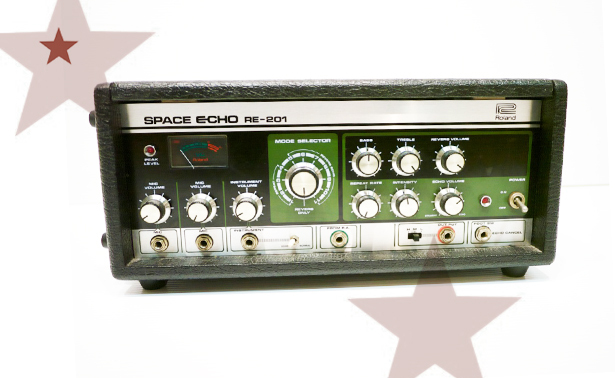 The Roland RE-201 Space Echo is a vintage Tape-Echo machine for creating truly analogue echo effects. The RE-201 uses an internal tape loop to record incoming signals which are then played back a number of times according to the settings specififed by the controls on the front panel of the machine. Because this unit uses actual tape to record and playback, the echoed sounds have a very warm, and “brown” sound in comparison to modern digital echo units. Tape can become tired and any degradation introduces highly unique sound characteristics. There are twelve settings including tape loop speed, number of repeats, levels and intensity. The Space Echo can provide warm, unpredictable and highly ‘tweakable’ echo effects as well as create feedback loops. You have heard it everywhere from Bob Marley through to Radiohead and Portishead. It is an essential unit for Dub and trip hop music. If you are looking for something more portable and affordable then the Line 6 DL4 might be the delay pedal you need, as it can simulate the Space Echo and a range of other vintage echo units.